One of my co-workers who lives in Porter Square let me know today that someone broke into his apartment last night. Apparently there was a "rash of break-ins" yesterday on the Cambridge side of the commuter rail tracks. So be on the lookout - and LOCK YOUR DOORS. Just hearing that has kinda put me on edge all day today. Its one of those events that I'm constantly worried about. I've always thought that the Porter area is generally pretty safe. One of the reasons I moved from Boston over to Porter Square was the crime rate in Boston steadily rose over the 7 years I lived there. 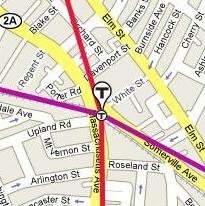 So, after a bit of searching today, I found some links to the Cambridge and Somerville Police Logs. I don't really read any of the local papers, so I don't keep up with the local happenings. Its really kinda sobering to read these logs and see all the arrests, robberies, and break-ins that happen -- especially when they happen right down the street from your own apartment! This is just a reminder for me not to fall into a false sense of security. Make sure valuables are hidden and you've got renter's insurance. Anyways, I need a beer now.... Well whaddya know - its Wednesday - and Wednesdays are for drinkin' at the People's. How convenient.